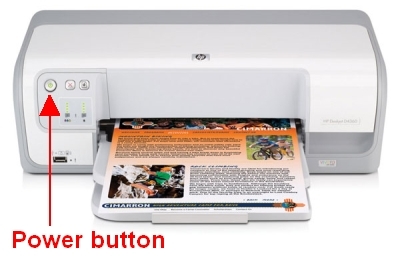 Which ink cartridges do I need for my HP Deskjet HP Deskjet D4360 Printer series Printer? For your US HP Deskjet D4360 Printer series Printer you need HP 74 Black AND HP 75 Tri-color cartridges OR HP 74XL Black AND HP 75XL Tri-color cartridges. For your European or UK HP Deskjet D4360 Printer series Printer you need HP 350 Black AND HP 351 Tri-color cartridges OR HP 350XL Black AND HP 351XL Tri-colorcartridges. 3. Open the cartridge access door. The carriage moves to the right side of the printer. 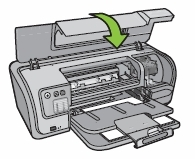 If the carriage does not move to the right side, turn off the printer, and then turn it on again. Wait until the carriage is idle and silent before proceeding. 4. Press down on the cartridge to release it, and then pull it toward you out its slot. Remove the cartridge from the slot on the left to replace the tri-color cartridge. 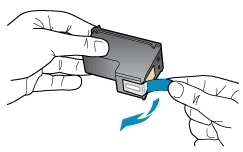 Remove the cartridge from the slot on the right to replace the black cartridge. 7. Hold the new cartridge by its sides. 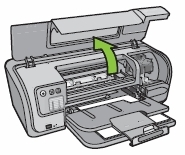 Hold the cartridge so that the copper strips are on the bottom and facing toward the printer. 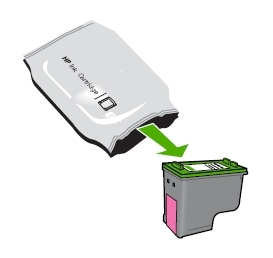 Slide the new print cartridge at a slight upward angle into the empty slot. Then gently push on the upper part of the print cartridge forward until it snaps into place. 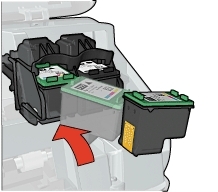 If you are installing the tri-color print cartridge, slide it into the left slot. 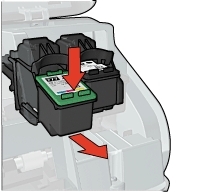 If you are installing the black print cartridge, slide it into the right slot.